If you’re a stay at home mom or if you’re like me and have been laid off and now looking for a job with more flexibility, than one of these legit work at home jobs may be for you. I have done a few of them and found blogging was the one that worked best for me to be able to do something I love and get paid for it. I am sharing 5 of my favorites plus a bonus, 4 of which I currently still do or have done in the past. Check them out and be sure to leave comments with any jobs you may have done and would recommend to others. Also if you have any questions, I would be happy to answer them in the comments as well. Like to write? Why not become a freelancer? Not sure what to write about? Check out this FREE list of 200+ niches (and sub-niches) to choose from to help you decide. If you are serious about freelance writing and want to sign up for a more advanced course, then check out 30 Days or Less to Freelance Writing to Success. With 30 Days or Less to Freelance Writing to Success, you will get walked through everything you need to know before embarking on your freelance journey. You can check out some success stories and the full course curriculum here to see if it’s right for you. Need motivation? Check out how one mom was able to make $1200 in her first 3 months as a part-time freelance writer. If you’re looking for a way to work full or part-time from home, being a virtual assistant may work for you. What services can you offer as a VA? Grab Gina Horkey’s Free list of 150 VA Services, you are sure to find services that fit your experience. She also offers a full course on becoming a virtual assistant called 30 Days or Less to Virtual Assistant Success that you can check out. I know in the blogging world we all need VA’s, so the demand is high. A lot of bloggers actually become Virtual Assistant’s to supplement their income as they build their blog. Keep in mind you definitely don’t have to be a blogger to be a VA. This is the one I am most passionate about and currently making a part-time income from. 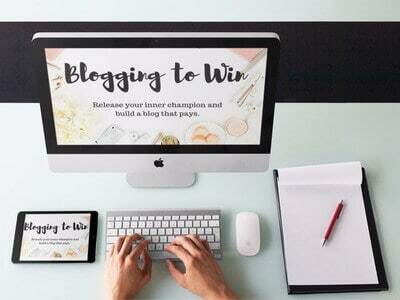 If you want to create a blog and make money with it, or if you have a blog but are not making enough money from it then you should check out Blogging to Win. Blogging to Win.is a free blogging course, designed to help you get your feet wet with the basics of blogging! The instructor Allison Linstrom even goes over how to get a domain name and hosting as well as how to plan your content and grow your blog. This is a perfect free course for beginner bloggers to help you build a blog that can last and make you money. You can sign up here. I currently still perform tests for a company called UserTesting. It is super easy, and you get $10 via PayPal for every 20-minute video you complete. UserTesting pays you to visit websites or apps, complete a set of tasks, and speak your thoughts aloud. You have to be in a quiet environment to do the tests so if you have a little one running around you may have to wait until they are asleep. I could literally do this all day long, but the problem is there are not many tests to complete, and you have to qualify for them with a quick survey which most times I don’t qualify. What I tend to do is keep my user testing window open while I am working on my blog and when tests come in I take the pre-qualifier and if I pass I do the test. Some days I can knock out 3 tests for $30 in less than an hour while other days I don’t get a single test. I would say this is good for anyone looking to earn a little extra money, but it definitely won’t create a full-time income. If you can test on your phone, tablet, and computer, you may get more tests. I currently only test on my laptop. I was an independent agent for Leapforce At Home about 5 years ago. As an independent agent, you will conduct in-depth internet-based research and provide information evaluation for leading companies from around the globe. What I didn’t love was the qualification process. Their basic requirements are that you have excellent web research skills and analytical abilities and excellent comprehension and written communication skills but to become a Leapforce At Home independent agent, you are required to take and pass a three-part qualification exam. The exam tests both your theoretical and practical comprehension of search engine evaluation. I was able to pass the exam, but I did have to study to do so. I had friends who are pretty smart and educated take the test and not pass recently, so I am not sure if it has gotten harder due to the number of people applying for positions, but it is definitely worth the try. You do get one chance to retake the test I believe. If you are interested in working for Leapforce, you can check them out here. Wait that is 6? Yes, I can count but I wanted to add this one on as a bonus job, and since most of the mystery shops I have done require you to leave your house it technically isn’t a “work at home job, ” but it’s close. Mystery shopping usually involves doing things you are already going to do like going shopping and going out to eat etc. Plus more and more companies are offering phone and internet mystery shops, so it was worth adding. Yes, they are real, and I have been on and off mystery shopping for years now. Shoppers are given details, by the mystery shopping company responsible for the shopping program, about expectations for making specific observations during their visits to or interactions with the establishment (some shops are online and/or via telephone) and the shoppers complete reports, often using an online form, after leaving the establishment. Shoppers serve as the eyes and ears for those clients as part of their efforts to enhance the quality of the customer experience. If you want to find out more about my experience you can read my article here. That article also helps you choose legit companies to work for and I also mention how to avoid scams such as check cashing scams etc. My best tips are to make sure the company is legit by searching for them on MSPA and never ever cash or deposit a check as part of a mystery shop. You may also want to check out this highly rated book on Amazon that gives you all the insider tips on mystery shopping. What do you think about these legit work at home jobs? Any of these work for you? Let me know your thoughts in the comments below. I am very interested in user testing in my free time, thanks. I plan to check it out. Yes, it is fun! Definitely check it out hopefully you can qualify for more tests than I can. Oh man, thanks. Lol. I thought this was going to be a join my team post. I heard the same thing about Leapforce’s qualification process and have been a little apprehensive of applying. I may give it a try simply because I love to conduct research on the internet and believe I would do well. Thanks for the tips.